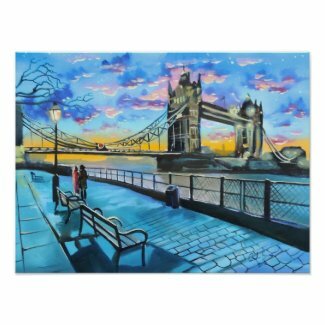 Here are my original paintings of London including Big Ben, the houses of Parliament and the Thames and various street scenes. In some of the work on display you can find red double decker buses, red post boxes and romantic couples with umbrellas. 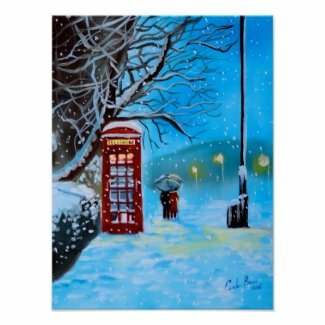 The paintings are London in the snow and rain. A scene from the rooftops, Peter Pan and Wendy sit upon chimney tops. This is an original oil canvas painting that measures 24 inches by 18 inches. Popup Painting & Events were very kind to feature my painting for their London event recently. 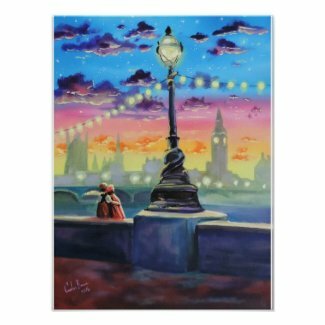 "Lights of London" Is one of my new London paintings set during winter. A girl holds a red umbrella viewing the houses of parliament. Below is a selection of some of the Houses of Parliament paintings that Monet painted on visits to London over a 5 year period. The differences in colour reflect differing weather conditions.